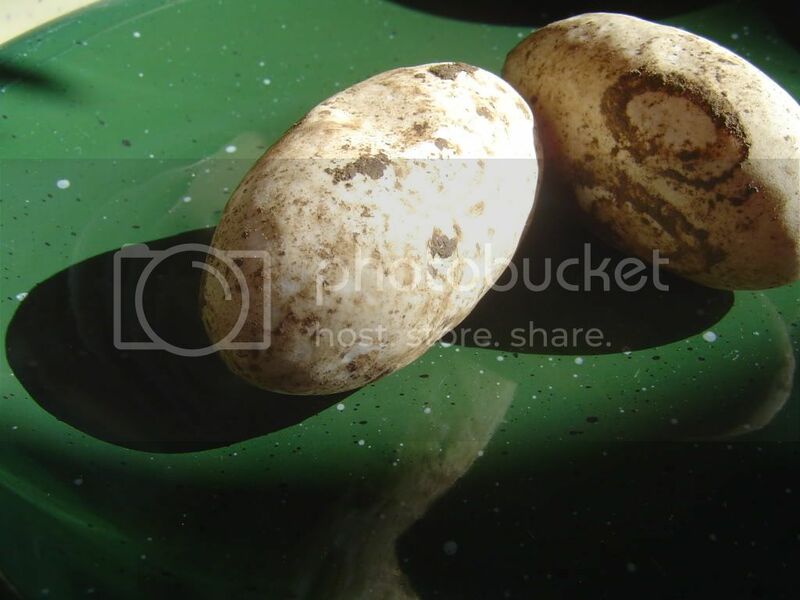 On my latest market foray I chanced upon something I'd never tried before: itlog ng bayawak (monitor lizard eggs) I had eaten bayawak meat before but I had never sampled nor even seen bayawak eggs. They looked like palm-sized dinosaur eggs. The shells were not hard; they were tough but pliable like thick parchment paper. Always eager to try new food I bought a couple. At Php120 a pop they weren't cheap. The guy said to just boil them like chicken eggs. When I got home I washed off the mud (like crocodiles, monitor lizards bury their clutch of eggs) and boiled them for 10 minutes. I sliced one open: what came out resembled very rich cream...the white and the yolk were not distinct. It was delicious, like balut yolk! Strange, the proteins did not solidify like those from a chicken egg. I boiled the other 5, 10, 15 more minutes but prodding the egg I could tell the contents were not solid. Does anyone have any experience with this stuff? Strange but delicious. While we're on the subject of culinary exotica let me reel off the stuff I've eaten that most people (particularly non-Asians) might find gross. Balut, of course is hard for the westerner (and even some Filipinos) to stomach even though it's ubiquitous on the streets. I've been known to down 5 baluts in quick succession not as a show of bravado but simply because I love the stuff. I only stopped at 5 for fear of a heart attack from all the cholesterol hehe. Other street food offerings include isaw (pig intestine), "betamax" grilled pig's blood, and pig's face. Other than street food, let's see...wild boar, fried earthworms, bull-testicles, all sorts of eyeballs, ants, snake meat (tastes like chicken), crickets (Kapampangan-style), bongkawil (big fat palm-sized sea snails from Mindanao), and some kind of deep-fried worms Chef Gene brought back from Thailand. Yes, I've had dog meat. To each his own. 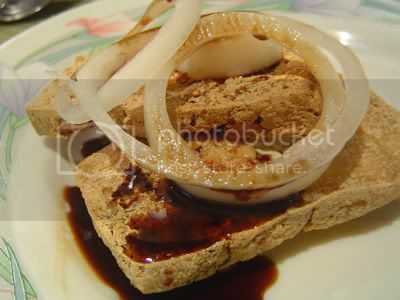 Heck, most non-Asians will find bagoong (fish paste), which appears at almost every Filipino meal, repulsive. Me, I find all the chemicals in American processed food disgusting, and with good reason. Bayawak eggs never gave anyone cancer. Some time ago, I had been hired as a chef/consultant for an event along with my friends Ina, Che, and Derick. The event had a very interesting concept that really got us excited. 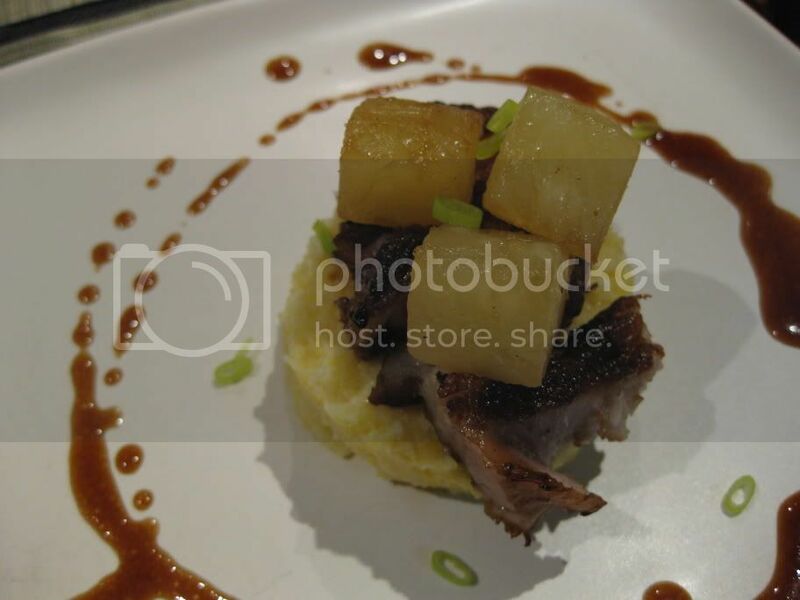 We were to design and execute a menu that fused Filipino street food with fine dining. We designed the menu, went through several revisions to stay within budget, and even did a food tasting for the client. Sadly the event fell through due to budget constraints. I heard on the grapevine that the event may still push through but we're no longer going to be a part of it. I'm guessing they're getting some HRM students to do it for free. Ah well, chalk another one up to experience. Anyways I couldn't let a perfectly good menu go to waste so I went and cooked it at home for my family and some of our friends. 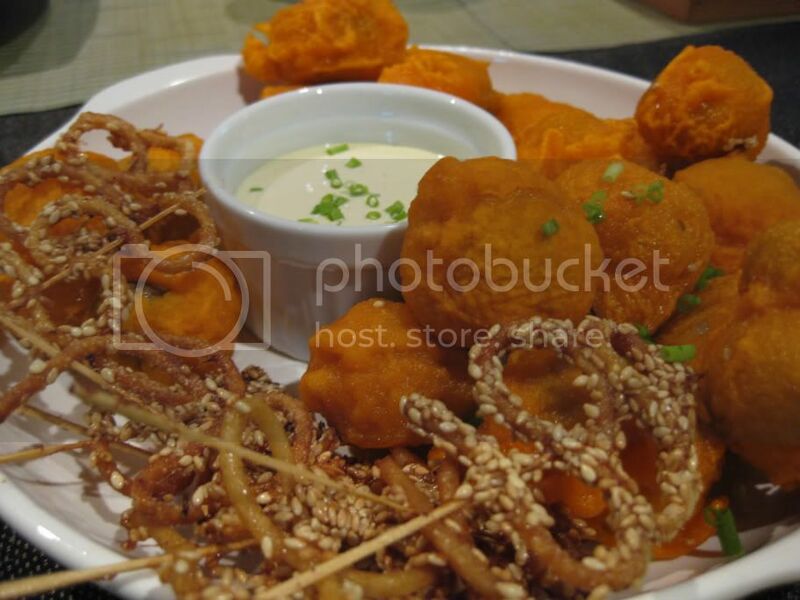 The faux kwek-kwek are actually cheese-stuffed champignon mushrooms coated in traditional orange-colored street batter. The faux isaw are deep-fried sesame-soy bucatini. The dipping sauce is a simple chive and sour cream mixture. That's pretty self-explanatory. 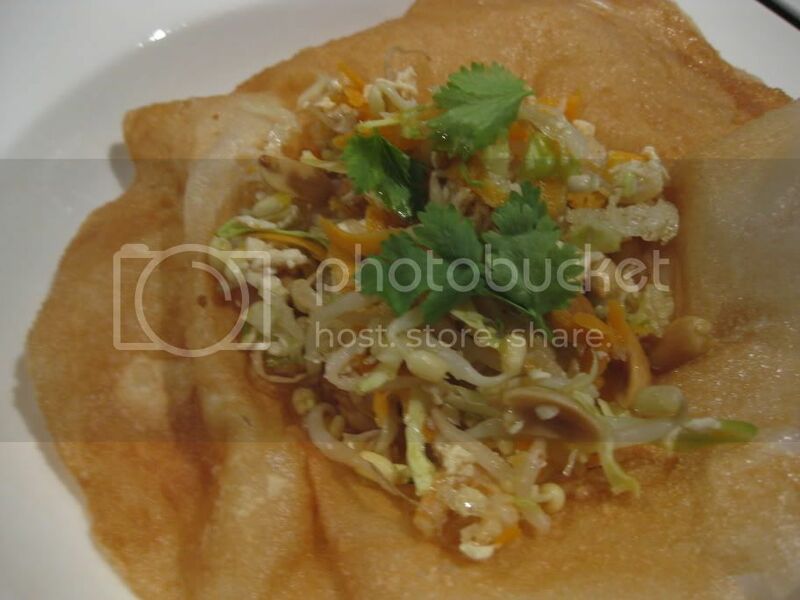 I made some crunchy baskets out of fried lumpia wrapper, and filled them with lumpia filling: carrot, tofu, bean sprouts, shredded cabbage, garlic, minced pork, shallots, baby shrimp, whole roasted peanuts, crunchy fried vermicelli. The dressing: thai nam pla, lime juice, minced coriander, muscovado sugar, and a touch of chilli. Braised the liempo til it was melt in your mouth before roasting it. The marinade (which was also made into the sauce after about an hour of simmering) was pinoy-style BBQ: garlic, onions, soy, vinegar, brown sugar, banana ketchup, and Sprite. The original menu had binatog as the starch but as I couldn't get my hands on any binatog this weekend I just roasted some corn and mixed it into some polenta. Sadly it didn't work as well as the binatog had but it wasn't half bad. First I made the suman (sticky coconut rice cake). Then I cooked down some gata (coconut cream) to make the latik. I made some coconut flavored ice cream and folded the latik into that. Topped the suman with a quenelle of ice cream, and sprinkled on some panocha (palm sugar) shavings. Delicious! Dinner sponsored by my mom hehehe. A funny thing happened last Friday: Sarah YM'd me that someone had left a note on each of her two blogs in an effort to contact me. Apparently Jessica Soho's Kapuso Mo on GMA 7 are doing an episode on sampaguaita (yes, our national flower) and want to feature the Sampaguita Ice Cream with Mango Sauce we'd served at our Legacy Buffet. Whilst wondering how they could've made the connection from me to my sister and deciding that it must've been because she links to my blog, I log in and find similar messages left for me at my food blog (yeah, this one). I'm still scratching my head over it all when I get a text message from school. Apparently the show's researchers had followed that trail trying to track me down. A few minutes later the phone rings. They've finally pinned me down at home. These guys are good! They want to interview me and they want me to do a demo. They want to shoot the segment on Sunday but I can't because I'm cooking for an event that day. We set it up for Monday, subject to my chef-instructors' approval (I contact Chef Junjun and Chef Gino and they're very supportive) and kitchen schedules at school (fortunately Monday is a holiday and so there are no classes going on). And then there's the matter of the sampaguita infusion, a month long process. Chef Gino's got some infusion on hand so everything's a go. As usual on a Dine&Jam morning I'm up at 5:00 to go to the weekly Farmer's Market at the Lung Center. Then it's cooking all day, til late night. Around 10:00 I jaunt over to Kidlat's place to see the guys, and we end up chatting til 5:00am Monday. Later that morning I'm in the kitchen with Che who was my sous chef for pastry back when we did the Legacy Buffet. 3pm the TV crew arrives and we shoot until 6:00. I've never been very comfortable in front of a camera, and I'm sure that it showed. It helped a little that for the most part I was cooking and so didn't have to look into the lens but when it was all over Steph told me I'd been speaking much too softly. Gotta work on that if I want to be on the Food Channel hahaha! Watch for my soft-spoken demo on Kapuso Mo, Jessica Soho this Saturday, June14. The show runs on GMA-7 from 8:30PM to 9:30PM. Saw the episode tonight, and I'm just glad I didn't look as shy as I thought I would on camera hahaha! A bit of a disclaimer though: the segment seemed to imply that I invented the recipe, which I didn't. I have to credit our Chef-Instructors Gene Gonzalez and Junjun de Guzman for helping us develop the recipe for the Sampaguita Ice Cream we served at our Legacy Buffet. During the taping of the segment, the assistance of my classmate Cheryl Go was invaluable. Che was one of my sous chefs for our Legacy Buffet, and led the pastry team in preparing the Sampaguita Ice Cream. 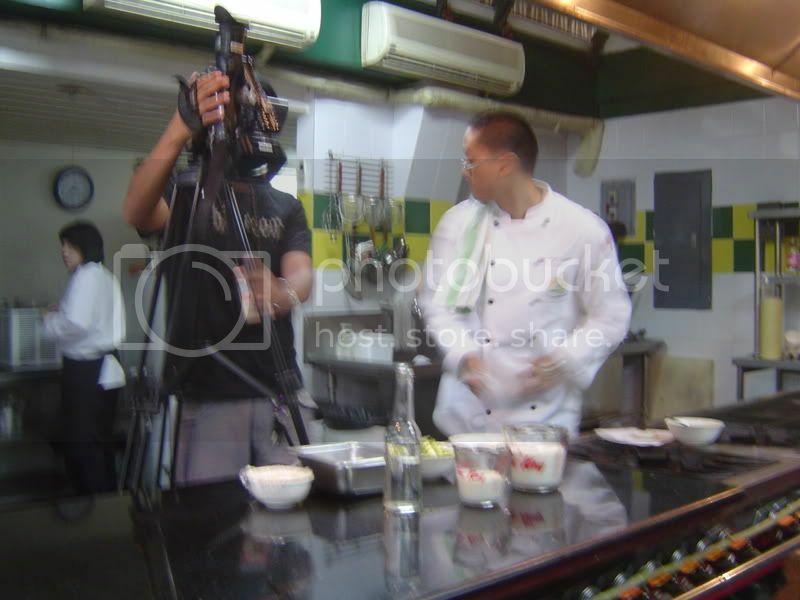 Also instrumental in making that segment possible was the support of another of our Chef-Instructors Gino Gonzalez. 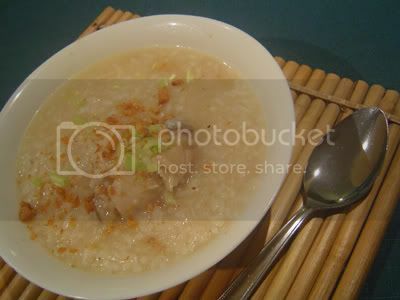 To me this is the epitome of comfort food: Arroz Caldo (chicken porridge), and Tokwa't Tokwa (tofu fried til crisp, topped with onions and served with a sauce of sweet soy, a little vinegar & sugar, and minced onions) Traditionally this would have been Tokwa't Baboy (tofu & pork in a lighter version of the sauce) but we're trying to limit pork consumption in this house...yeah right, see my last post hahaha! Coming home on a stormy night, nothing warms the soul like this pair right here. As a special treat, my sister Sarah had the dishes well underway when I arrived at 6pm. Dinner was ready at 6:30. My sister is a relative novice in the kitchen, but she's coming along fine. The steaming bowl of arroz caldo was really good, with just the right amount of ginger. I went wild with the traditional toppings: garlic chips and spring onions. And a few drops of kalamansi juice, and it was perfect. Oooh not quite: Papa & I, had to have siling labuyo (spur chili). I considered tossing on a few saffron strands but dismissed the thought because I was already hungry. 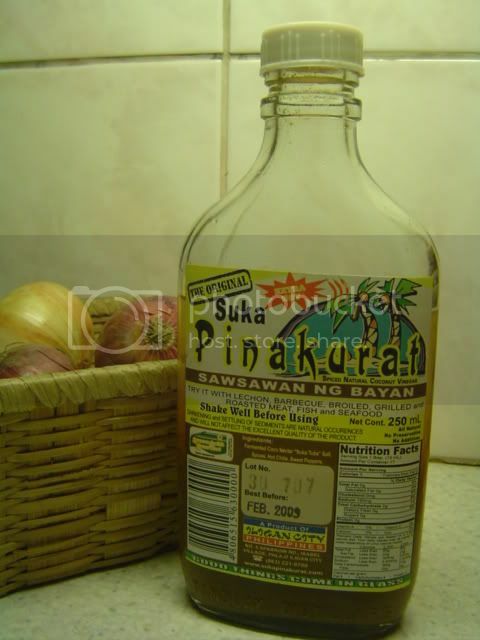 Coming home from one of his business trips to the provinces, Papa brought home a bottle of what looked to be vinegar with a curious name: Pinakurat - Sawsawan ng Bayan. Interesting. It was from Iligan. Up until then the only product of this north-eastern Mindanao city I'd ever encountered was Glenn, my dorm roomie back in highschool hehehe. The vinegar was coconut-based , looked like it was flavored with isdang bagoong (salted fermented anchovies), and it was labelled extra hot. Just as an aside: for me, if we're talking about vinegar for Pinoy food it just doesn't get any better than coconut-based. Throw out the cane vinegar. And please, don't give me that supermarket-bought battery-acid. Coconut vinegar (paombong, sukang sasa, sukang tuba, what have you) has body, and the sourness is not reminiscent of chemistry-lab acid. And so the Pinakurat did turn out to be very hot. Good thing we're big on spicy food in this family. I asked some people who speak the dialect what the word "pinakurat" means, and I learned that pinakurat is a method of cooking something very quickly. Some also explained that the word is the equivalent of "ginulat" in Tagalog. It's a great description for this dip, as it really does wake you up. Apparently the most common use for it is as a dip for lechon (whole pig roasted in an open pit). As we Filipinos know, lechon in the Visayas and Mindanao is accompanied, not by sarsa like in Luzon, but by vinegar. We're not big pork eaters though, and lechon holds no attraction for me, and so for me pinakurat has been used as a dip for all manner of grilled fish. I even sometimes use it as a marinade. Just throw in some chopped onions and you're all set. When we ran out of the stuff we wondered whether we'd have to wait for Papa's next business trip to the area to replenish our supply. We were elated to find that it's available at Cherry Foodarama (at a small markup). Here's to more happy meals spiced with pinakurat! 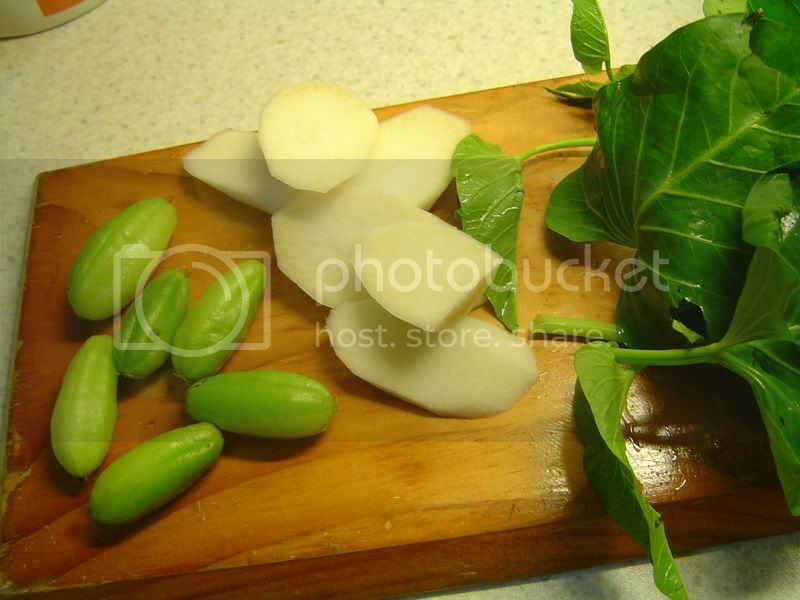 Dinner last night was sinigang na pompano sa kamias. Papa came back last week from a Cagayan de Oro-GenSan-Davao business trip, and he brought back a lot of really gorgeous fish. I'd had pompano before but I'd never cooked it myself. I like my sinigang very sour. Gimme lots of onions, and ugh no gabi please! (my apologies if you're a fan of sinigang thick with gabi) Cabbage is ok for prawns, but for fish gimme kangkong. And don't forget the siling haba! Beware, if I cook it there will probably be several sili, and possibly crushed. But not last night. Now of all the different variants of the humble sinigang, sinigang sa bayabas is my least favorite. Sinigang sa sampalok takes middle rank. I've heard of but not tried sinigang sa pakwan. Sinigang sa kamias has always been my favorite. Slow fade to memories from my childhood in Batangas City where "kalamyas" as it is called there was so abundant we kids used to pick them off the trees and munch on them. The trees were small and no good for climbing, but the leaves lent good cover to toy soldiers. The mushy overripe fruit served well as harmless grenades during mock wars as we ran around the neighborhood. For cooking, kalamyas could be had both fresh and sun-dried. I never see the dried variety anywhere anymore. In fact the fresh ones aren't so readily available here in Manila either. We're fortunate to have access to a nearby tree. I should try sun-drying a few myself when there are more fruit. This time of year there's only ever a handful of runt fruits on the tree, and all of them were picked for last night's sinigang.